The last few weeks have led to some new book discoveries, mainly due to me raiding the "Caldecott" section of my library where they have "winner" and "honor" books set aside. Not all Caldecotts are automatic "winners" in my book, but a lot of them are, and it is a good place to start if your library has a similar section. A couple of these books have become new favorites, for myself and my daughter. Some have even made it on to my amazon wish list. 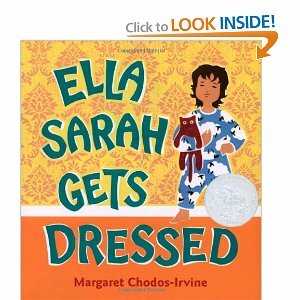 If you have a child with their own, distinct, fashion sense, this book will make you smile as much as your listeners. Coryn loves watching as Ella Sarah gets more and more frustrated ("She's angry, Mommy!") with other people's attempts to dress her in bland clothes when she has the "perfect" outfit in mind. This book's stark, black and white illustrations tell a lively story of a little boy who longs for nothing more than to be a jazz musician. When his friends catch him playing his imaginary horn, he is temporarily discouraged only to have an unexpected hero offer him the encouragement he needs. There are pictures of several different instruments and the book would lend well to a preschool music curriculum. When tucking Coryn in the night of the library trip, I asked Coryn which book was her favorite, and she swiftly said the one with the animals. In Hush! : A Thai Lullaby a mother is forced to sing to every animal in the forest, attempting to quiet them so her baby won't wake up. She goes as far as to take on an elephant which sent Coryn into immediate giggles. The rhymes are pleasantly rhythmic though apparently Thai ducks say "Ghap-ghap" instead of "quack-quack" which can cause pause. . .you might choose to relay sounds your child is used to to avoid them arguing with the book, but that's up to you. I was pleasantly surprised when Coryn brought me this book and even more surprised when she sat through it. This classic poem is simple enough and tells enough of a narrative to introduce even young readers to their first "non-nursery rhyme" poetry. This version has simple pictures but each manages to tell a story in its own right. Coryn was attracted to the dragon on this cover. It isn't a story so much as an essay on how to survive a fairy tale, but the pictures draw you in and the text is soothing. However, after the first read through (which was uneventful), she decided it was too scary and hasn't asked for it again. There are some monsters in the book, more grotesque than scary, but I'm letting her set the pace here, so we probably won't read it again. This book has one draw: it's tiny. The book itself is only about two inches by two inches and Coryn was fascinated by this and loves to carry it around the house with her. The text and pictures are "meh" in my opinion, but since she loves to carry it around with her, we've read it a few times.